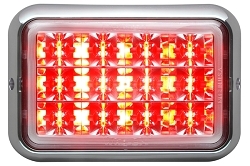 Nova Electronics Ultrathin LED Warning head, the SLULTRA, contains 18 wide-angle high-intensity LEDs. Completely self-contained, the SLULTRA features 8 flash patterns and a state-of-the-art random pattern selection mode. A single wire pattern selection scheme is standard for easy hookup. The SLULTRA SURFACE MOUNTS directly to the truck body with only two mounting screws and installs easily with a three-wire hookup - no external power supply is required! im a storm chaser and former fire fighter. i use two amber slultras in the rear sides of my 99 durango. 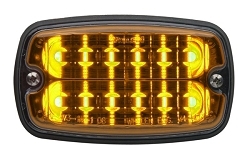 these are great lights for added warning and or secondary warning. they are bright enough to show through the window tint also. 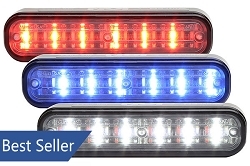 i recommend these lights and also they are priced just right. Copyright Strobes N' More LLC. All Rights Reserved.